Karen – From SpongePedia, the biggest SpongeBob-wiki in the world! Security system in flashbacks from "Friend or Foe?" Temporary Krusty Krab cashier in "Karen 2.0"
Karen is one of the main characters in the series. She is the computer system of Sheldon Plankton's laboratory, as well as his henchwoman, best friend and wife. She usually comes up with plans to steal the Krabby Patty secret formula, which Plankton tends to claim as his own ideas. She is voiced by Jill Talley, an actress who is also the wife of SpongeBob's voice actor Tom Kenny. Karen was introduced in the episode "Plankton!" along with her husband. She is one of the two main antagonists. As revealed in the "Friend or Foe?" special, Karen was just a security system when she started dating Sheldon. She has a Northwestern accent, in contrast to Sandy the Squirrel's Western accent and Plankton's Eastern accent. In the movie, Karen informs Plankton of "Plan Z" by setting into motion the rest of the film's events. The movie also marks the first time Karen is seen throughout her whole body; she is smaller and has wheels. Plankton also installed a button into Karen that would help him succeed in Plan Z and take over Bikini Bottom. In the sequel, she also plays a main role by powering the time machine that SpongeBob and Plankton use. She shares a heartfelt moment with Plankton when she is about to lose all of her power. She has a green wave on her screen to tell in which frequency she is speaking at. She has many buttons below the screen. Clem and the rest of Plankton's Cousins think that she is pretty. She has a built in analyzer, which can tell the ingredients in an item. In the majority of her appearances, Karen manifests as a large monitor in Plankton's lab or as her mobile, wheeled form. 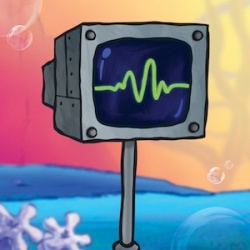 She is also installed into most of Plankton's inventions, such as Robot Krabs, Plankton's seashell submarine (as seen in It Came From Goo Lagoon), and the Chum Bucket's fist itself (as seen in 20,000 Patties Under the Sea). In the episode Goo Goo Gas, her baby face is shown as that of a calculator. As a baby, the only word she knows is "Hello". Karen and Plankton share a family. Karen has a mother-in-law named "EMILP", who is seen in "Single Cell Anniversary" as a computer program. Her father, Fredrick, has never been seen in the series, but appears in an issue of Nickelodeon Magazine. Karen's cousins-in-law are Plankton's Cousins and Clem. Some of the Planktons' ancestors have been shown: Planktonamor, Dead Eye Plankton, and Karen the Crystal Ball, the latter of which acted exactly like modern Karen but inside a crystal ball. "I suppose it would, if I had one." This page was last modified on 8 March 2019, at 15:02. This page has been accessed 81,832 times.